Bus Rapid Transit systems are cost-effective transport solutions for cities but are relatively new phenomena in Africa. A total of 207 cities worldwide have implemented Bus Rapid Transit (BRT) as part of their transport policies. The first BRT system opened in Latin America in the 1970s and the continent has now 69 cities with BRT (data as of November 2016, retrieved from Wikipedia). A number of innovations were introduced in the BRT system in Bogotá, Colombia, which opened in 2000. 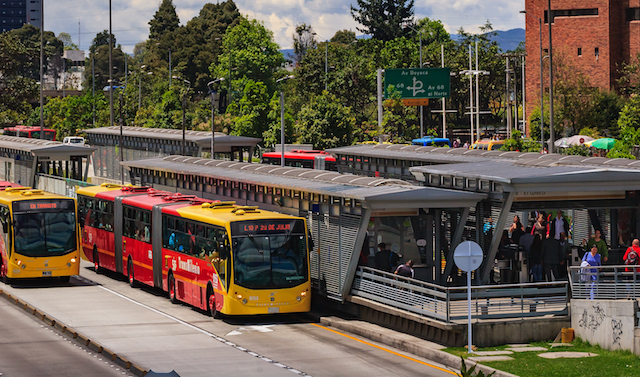 As pictured, this BRT has two bus lanes per direction and is branded as TransMilenio (photo by iStock). African’s first BRT system was inaugurated in Lagos, Nigeria, in 2008. Last month, the Lagos State Government announced that the system will be extended with a new corridor, which will serve mainly middle class citizens. According to a dedicated Wikipedia page, Africa currently counts seven BRT systems with three systems opened in 2016. Two of these entered service in November of 2016, namely Marrakech in Morocco and Accra in Ghana. Both capital costs of building and implementing BRT as operational costs of BRT are attractive and generally lower than those of light rail or metro systems. BRT has features of rail rapid transit, including its own right of way (typically on bus lanes, segregated from other traffic), good quality vehicles, short headways and stations with off-board fare collection. These features result in the smooth and fast operation of the BRT service. BRT has better key performance indicators, like travel times for passengers and capacity in terms of passengers per hour, than conventional buses operating in mixed traffic. Critics of BRT argue that these key performance indicators do not reach by far those of rail systems. According to them, BRT is also not attractive enough to encourage people to shift from private cars to public transport. However, for countries with limited funding capacity, BRT is definitely a good way to bring modern public transport to their cities. Considering the total capital costs (thus including stations and other assets), cities can build 5-10 km of BRT for the same budget for which they can build only 1 km of urban railway. This makes BRT a powerful solution to increase transport effectiveness and urban economic productivity. East Africa is one of the regions where BRT investments are very cost-effective to decrease travel times and boost economic development. Ethiopia’s capital Addis Ababa has boasted a light rail system since 2015 and currently is working on plans for a BRT system. Financed by the World Bank, Uganda has carried out several BRT studies in its capital Kampala. 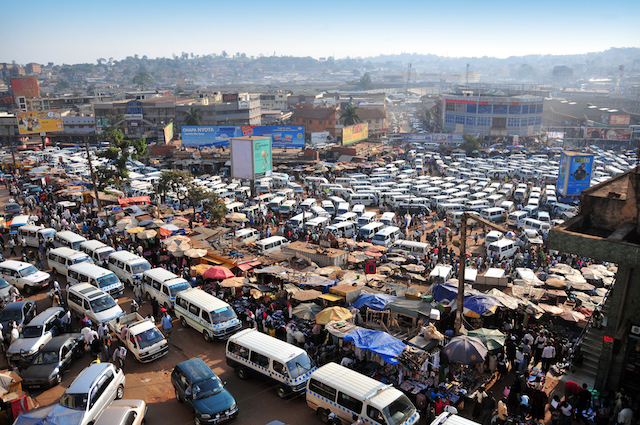 As pictured, its current minibus transport system goes hand in hand with an overcrowded transport hub at its city centre (photo by iStock). More or less similar scenes can be found on minibus and bus stations in Kenya’s capital Nairobi where plans for BRT lines are also underway. Tanzania’s largest city Dar es Salaam inaugurated its new BRT system in May 2016. That means that this metropolitan area of more than 4 million people now has its first formal public transport system. Several sources, e.g. this article on the World Banks’ website, suggest that the BRT system (with its first corridor of 21 kilometres and a second corridor being built soon) is very successful and that travel times of many people have dropped significantly. 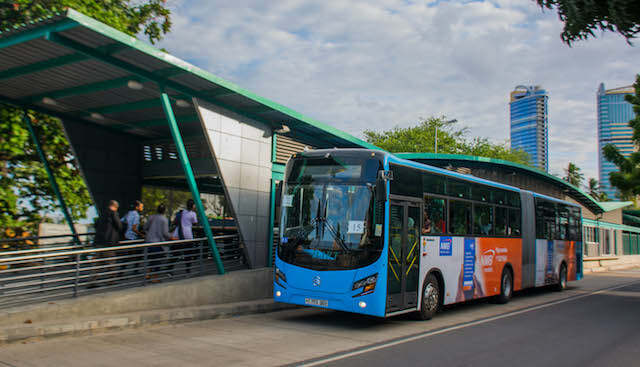 As pictured, this BRT has stations made of quite basic materials, but the system is well designed and has all the main features of high quality BRT (photo from tourist website InDaressalaam). African people and economies deserve good functioning transport systems. Besides railway investments, investments in Bus Rapid Transit contribute greatly to African economies and that is what important stakeholders in the African public transport community realise. Dr Ousmane Thiam, president of the urban transport authority in Dakar, Senegal, predicts a significant development of BRT in Africa in the coming years. It is unclear how fast this development will go, but with three systems opened in 2016, in Marrakech, Accra and Dar es Salaam (the latter being the most successful so far), it looks like Bus Rapid Transit has proven to be a promising investment on the African continent. 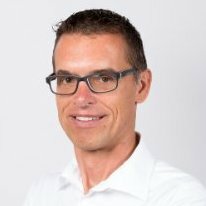 Arjen Jaarsma is a consultant with 20 years of experience in public transport. He provides consulting services for public transport projects and is specialised in public transport visions, public transport business models and related public transport topics. For more information about Arjen and his work click here.